French Onion Soup is a classic dish made from beef broth and caramelized onions. It is served in a ramekin and topped with toasted bread and cheese. The soup is finished off by placing the dish under a broiler until it is melted and bubbly. The modern version of this soup was created in Paris in the 18th century, but onion soups have been popular as far back as Roman times. Although this is known as an elegant dish today, it was traditionally a pheasant food throughout history as onions were plentiful and easy to grow. 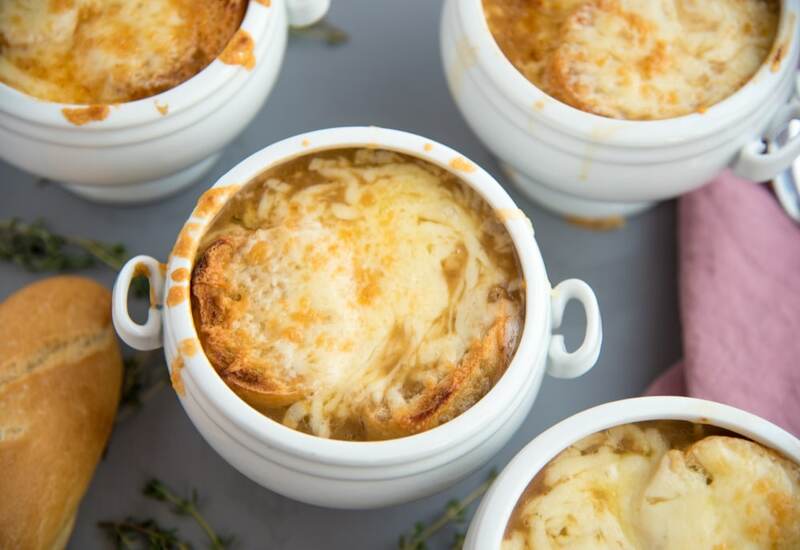 In Paris, French Onion Soup is known as a great hangover cure. Oh, la-la...Pass the champagne! If this is the cure, bring on the bubbly! Per Serving: 654 calories; 28g fat; 68.7g carbohydrates; 35g protein; 78mg cholesterol; 2878mg sodium. This is a rich and simple soup that turned out great. I skipped the baguette and used croutons instead. I love the Gruyere cheese, much better than some recipes that call for parmesan. Nice! This is a solid recipe. Perfect for cold, chilly days. I'd like to learn to make homemade beef broth, but I did use store bought when I made this recipe and it was still great. I'll be making it a few times this winter! People don’t realize how simple French onion soup is! I added braised short rib and it was everything. Perfect with crusty bread. Love French Onion soup. I cut down the beef broth to 6 cups and added in some shredded cooked chuck roast. Also added brie cheese instead of the Gruyere. My all time favorite French onion soup!! I froze my leftovers in mason jars...it was GREAT reheated!! Not great. French onion soup typically requires caramelizing the onions. I thought the pressure cooking might take care of this but I was quite disappointed. This might be decent if the 5 minutes of softening the onions was actually 45 minutes of caramelizing them. We threw out the leftovers and won’t be making this again.